We are establishing hybrid chestnuts trees in the northeast as a staple crop. 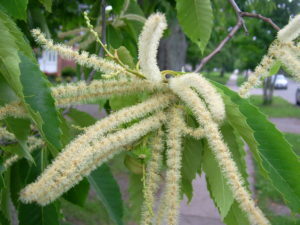 Chestnut trees produce a carbohydrate-heavy nut that can be processed into value-added products like gluten-free flour. These trees have produced up to 6,000 lbs/acre in orchards in northern climates and can do so without tillage, pesticides, or artificial fertilizers. Chestnuts are already a small-scale specialty crop (although we import ~90% of our chestnuts from Europe and Asia), but we want to establish them as a staple starch crop that can substitute for wheat, potatoes, and corn in certain uses. We have secured the land access and the seed to produce our first 3,000 seedlings in 2018. This process will expand to an additional ~10,000 seedlings by 2019, as well as selected grafted cultivars from existing blight resistant chestnut orchards. Initially our aim is to test, identify and promote the appropriate genetics, strategies, and practices for a regional chestnut industry. From that foundation we will expand chestnut plantings to hundreds of acres regionally, invest in harvesting and processing practices/infrastructure, and develop the national market, so that the table is set for when these orchards begin to reach sufficient maturity (Year 8-12). Chestnut trees produce competitive yields to annual staples, but can do so without many of the harmful practices that are associated with large-scale annual starch crop production. They are staple crops that reduce erosion, fix carbon in both aboveground biomass and soil (integrated tree-cropping systems are one of the most effective carbon drawdown strategies), and are resilient to climate change effects such as erratic frosts and drought. This is an ancient solution to food security. 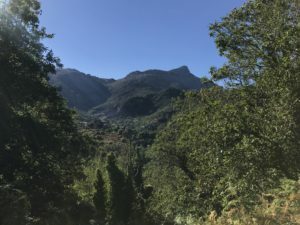 We encourage those interested to read about Corsica, Spain, where there are still-producing 600-year-old trees planted across thousands of acres of mountainside. Chestnuts are a crop that can go beyond feeding people to playing a role in healing watersheds and mitigating climate change. Ok, so why are there only 4,000 acres of chestnuts in the U.S? Good question. Our hypothesis is that the lack of U.S chestnut production is the result of the confluence of the chestnut blight and the birth of industrial agriculture. In the early 1900s, a fungal blight was brought into the U.S. on imported trees, and nearly all of the chestnuts in the U.S. were killed. This was catastrophic for eastern forests, and it also eliminated the nascent chestnut industry. The forest restoration project of breeding a blight resistant american chestnut has received significant funding and attention (although it could use a lot more! 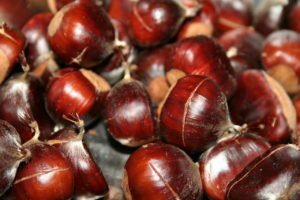 ), but chinese and hybrid chestnuts have not received much attention as a commercial nut crop. On the fringes of U.S. agriculture, tree crops, northern nut crops, permaculture, and agroforestry have all been topics of limited discussion and research. While mainstream agriculture has largely focused on optimizing the per-acre efficiency of annual crops and chemical dependent farming, the Castanea genus (chestnuts) has been awaiting its return to prominence. What type of land is appropriate for this project? Chestnuts are native to well-drained upland habitats. We are looking for either sloped or flat land with sandy soils that are mildly acidic. Alkaline and wet soil conditions are generally considered prohibitive for chestnuts. This project also does not require prime agricultural soils or land. If you have fields in hay production, chestnuts can be established at wide enough spacing to allow haying operations to continue. If you have abandoned or low-quality pasture, shrublands, or low-quality forestland, we can help you convert it into an orchard. Who can partner in this project? How can I help you? Anyone! This project will require a region-wide effort from farmers, researchers, consumers, teachers, investors, volunteers, restaurateurs, grocers, and many more. At its heart, this project is about developing an industry around a crop that helps this region to regenerate. Orchard Establishment: Hire AppleSeed Permaculture to design and implement an orchard master plan. Land Donation: Enter into a zero-cost lease, or gift your land to our non-profit land management company (in development), who will oversee the project’s establishment and management. Fund: Help finance the establishment and early stage management of our pilot orchards. This could be structured as a tax-deductible donation or a low-interest loan. Volunteer: Your time and or equipment. We will add you to our list, and contact you when their are opportunities to join in on the fun. The initial establishment costs roughly $2500-5000/acre. The high end estimate assumes the cost of labor for the establishment period (this can be avoided in exchange for project equity and or landowner labor). Additionally, the ongoing management costs are roughly $1,200/acre-year. Again, this is almost entirely labor costs, and can be avoided by landowners interested in managing their own orchards, or offering project equity to the land-management team. Communities from the Mediterranean region, Korea, and China. What does a chestnut-based orchard/farm look like? Silvopasture: Livestock integration with tree crops. May include sheep, pigs, goats, chickens, ducks, and/or cattle rotationally managed within the orchards. AppleSeed visited Corsica in the summer of 2017 to observe the patterns of their 600 year-old chestnut forests. Plant chestnuts on 20 acres by 2019. Establish (<1 acre) propagation and cultivar test sites local to production clusters. Grow a network of technical experts, researchers, farmers, landowners, and funding partners. Develop regional harvesting and processing infrastructure as trees obtain commercial yields in Years 8-10. Work with local research institutions to establish a regional chestnut manual. Generate a business case and investment fund for 1000+ acres in the northeast US.